Our doctors are specialists in pediatric dentistry and utilize state of the art technology. J. Kyle House, D.D.S.received his D.D.S. degree from the University of Texas Health Science Center at San Antonio and served as a General Dentist in the US Army. While stationed in Giessen, Germany, he was given the opportunity to treat children and discovered that pediatrics was clearly his favorite field. He attended his Pediatric Dental Residency at Madigan Army Medical Center, Fort Lewis, Washington and the University of Washington. After leaving the Army, he spent five years as the Director of Pediatric Oral Medicine at Scott & White Hospital Systems in Temple, Texas. Dr. House completed his Pediatric Dental Board Certification in April 1996. In 1999, he moved to Oregon to open his private practice in Hood River, which has expanded to four clinics (three in Oregon and one in the Tri­Cities, Washington). Dr. House's main concern is advocacy and access to care for children. He has served on numerous local, state, regional and national organizations that work to improve children's access to dental care, and has testified on behalf of children on a national level, providing medical information to lawmakers. In addition, Dr. House is a Consultant to the American Board of Pediatric Dentistry and has assisted in providing their Oral Clinical Exams since 2006. Dr. House enjoys being an active part of the community and spending time with his wife, Jill, and his three daughters. His latest project is developing a vineyard and learning about winemaking and viniculture. He likes being outdoors and loves to cook, creating imaginative breakfasts, and – like a true Texan – can explain the critical differences between grilling and barbecue. Hi! My name is Mackenzie Craik. Let me tell you a little about myself. I was born and raised right here in beautiful Walla Walla. After spending a few years in Alaska as a small child, my family returned to the valley where I attended elementary/middle school, high school, and college. I feel like I have fond memories on every street corner and peaceful country road. After completing my pre-doctoral studies at Walla Walla University, I continued on to the University of Washington for dental school. I then completed a rigorous two year Pediatric Dental Residency in Providence, Rhode Island. Living in the Northeast for the last two years, and being away from Walla Walla for the last six years overall has been a great experience. My family and I have thoroughly enjoyed the adventure of living in other regions, but it has also helped us to realize that there truly is no place like home. I am so grateful for the opportunity to provide specialized dental care for the children of this community. When I am not at the office, you will most likely find me hanging out with my five favorite people. My wonderful wife Emily, and my four little men: Hamilton (6), Maxwell (5), and our twins Montgomery and Winston (2). We love being outside in the fresh air, cooking and eating as a family, growing vegetable gardens, and playing sports. My name is Shane Schmidt and I graduated from dental school in 2010. I worked as a general dentist in New Mexico and Texas before specializing in pediatric dentistry. Pediatric dentistry is what I am passionate about and I am excited to use my skills to serve the kids in north east Oregon. I am originally from the North West and am happy to return after many years away. Most of my time is spent on my profession, family, and faith, and when opportunity permits, I love to participate in watersports. Dr. Trevor Allen was born and raised in Clackamas, Oregon. He graduated from Brigham Young University in 1990. Dr. Allen studied dentistry at Oregon Health Sciences University, where he graduated at the top of his class in 1994. He immediately continued on at OHSU, where he earned a certificate of Orthodontics and Dentofacial Orthopedics in 1996. Dr. Allen enjoys a variety of sports and outdoor activities, especially fishing, camping and baseball. He also likes to spend time at home with his wife, Lisa, and their five children. Currently he is learning how to play the bagpipes, which he describes as, "one of the hardest things I have ever done!" 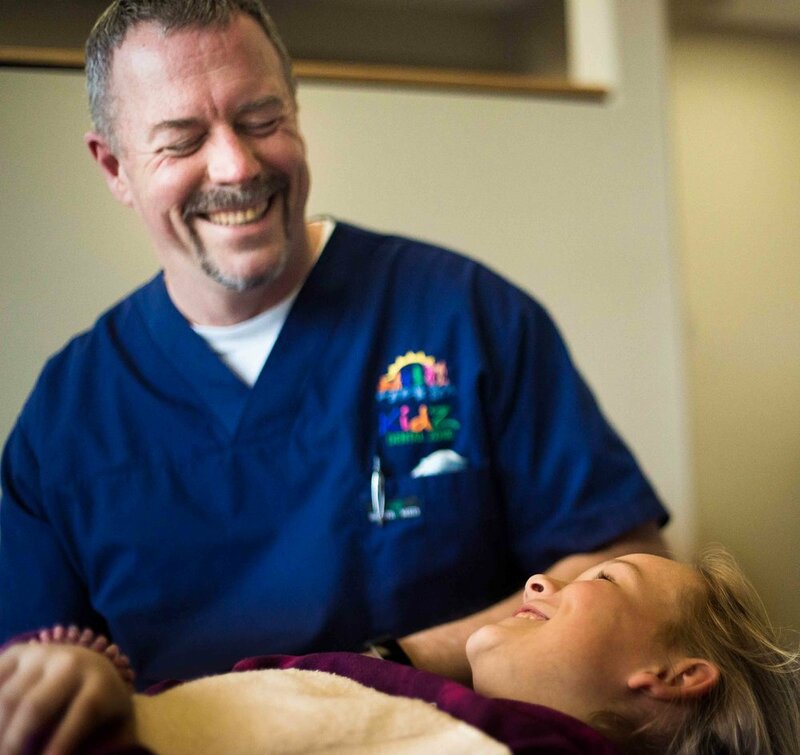 Dr. Allen strives to make every patient's orthodontic experience a positive one. "It’s great to be able to team up with our patients' dentists to provide each and every person with a beautiful, healthy smile." Dr. Ramos’s dental journey began after his honorable services in the United States Marine Corps. He then went on to obtain a dental degree at the University of Maryland, and honed his Pediatric Specialty training at Bronx Lebanon Hospital in New York City. During his residency, Dr. Ramos managed complex trauma cases and provided comprehensive care for under-served children, medically compromised patients, and those with special needs. Dr. Ramos committed his life to fighting sugar bugs so that the parents of Earth could live in peace. Dr. Ramos is excited to be a part of Advanced Pediatric Dentistry and to experience life in the Pacific Northwest, where he intends to explore the outdoors, and spend time with his dogs: Kodak, Gatsby, friends, and family.